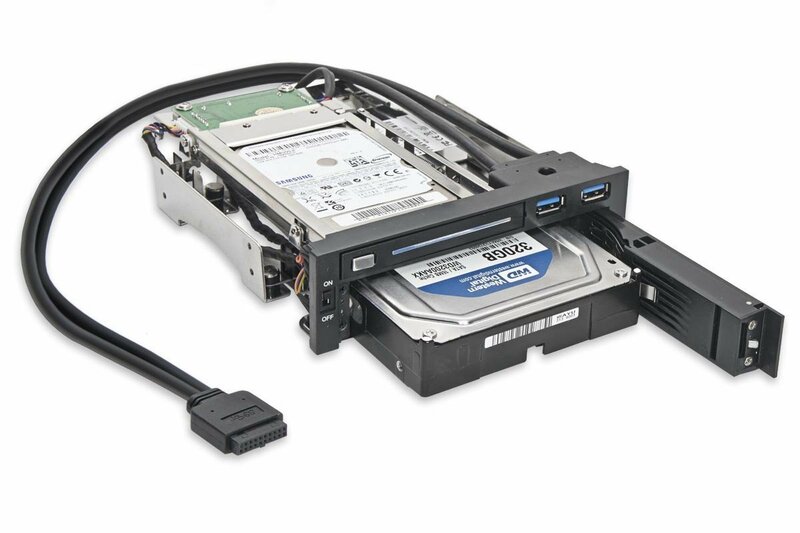 This drive caddy from Syba (part# SY-MRA55006) will make it really easy to remove / hot swap your drives in your desktop PC. It also features two USB 3.0 ports. I like to play with multiple operating systems on a secondary PC. This is ideal for allowing me to swap out the boot drive. I have lots of smaller hard drives that are ideal for playing with Linux distros, Hackintosh or pre-view copies of Windows. The Syba supports both 2.5” and 3.5” drives. The 2.5” drives are very common with SSD’s or laptop drives. The drives can be easily slid in and removed. I like to use offline storage/backups with my hard drives. This product is ideal for that. It requires two SATA data cables and one power cable. The USB 3 ports (which are optional) come with a standard USB 3 19 pin header. My only slight complaint is the LED’s are very bright. You can use a Sharpie or paint to tone them down. Tape could also work. The device is easy to install in a 5.25” bay. The SATA speeds can be up to 6Gbps. Also remember to enable HOT SWAP in your BIOS.